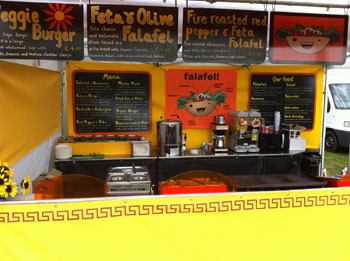 Vegeteria specialise in handmade, authentic Mediterranean cuisine. Using locally sourced fresh produce we make all our food with lots of love and passion. Our menu consists of several basic nutritious products that combine to make a delicious healthy fast food. Our all organic Falafels are made to an authentic recipe from a paste of organic chick peas, fresh parsley, onion and garlic, blended with traditional spices then cooked in vegetable oil. Served in a large pitta bread with a selection of salads and our home made Tahini and chilli sauces. 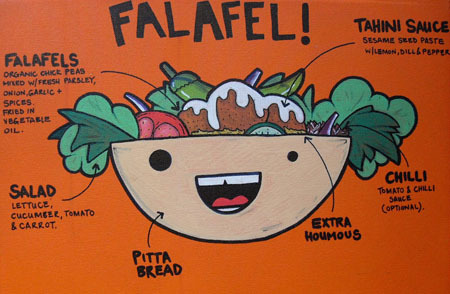 We also make fresh houmous served in the falafel or on it's own with salads. Spicy Aubergine and Tzatziki Falafel - Spicy Aubergines slow cooked in a tomato sauce served in a pitta with Tzatziki, Falafels and Salads. 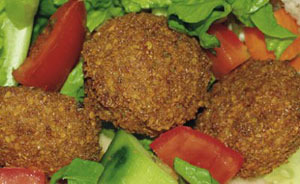 Feta and Olive Falafel - Feta cheese and Pitted Kalamata olives served in a Pitta bread with Falafels, salads and sauces. Feta cheese, fresh Houmous, Salads, Fresh tomato, Cucumber, Greek olives and a Traditional Greek herb dressing served in a large pitta bread. A combination plate of Tabbouleh, Falafels, Feta cheese and Spicy chick- pea salad, houmous, stuffed vine leaves, olives, coriander houmous, Tahini and chilli sauce, pitta bread and pickled chillis. Our Veggie Burger is a delicious quarter pound soya burger served in a large granary roll with salads and sauces. A wide range of hot and cold drinks are also available, including traditional fresh mint tea, herbal teas, Fairtrade tea, coffee and hot chocolate.